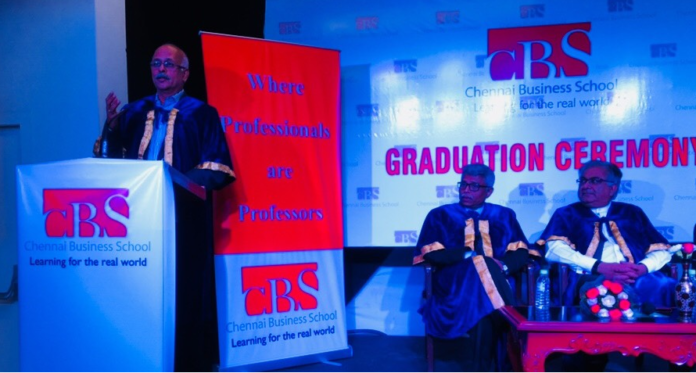 Chennai: Chennai Business School celebrated its 11th Graduation Ceremony and launched the “Knowledge Exchange Program” a fresh approach in this practice of meaningful interaction with industry. Knowledge Exchange is a very deeply involved practice in which CBS will identify industry wide challenges and provide well-researched and sustainable solutions. Mr. Rohtash Mal, MD & Chairman, EM3 Agri Services Private Limited launched the unique Knowledge Exchange Program of CBS and presented awards and certificates to the students. Mr. Muthu Kumar Thanu, Group Chief HR Officer, TAFE Ltd delivered the keynote address. Mr. Srikant Srinivasan, VP &Head – HR, L&T spoke about the CBS Knowledge Exchange Program. Addressing the gathering, Mr. J. N. Amrolia, CEO & Founding Director and Prof. Sridar Natarajan, Dean ,CBS explained about this unique initiative which is the first of its kind. The motto of Chennai Business School (CBS) is “learning for the real world” A Business School promoted and run by experienced Industry professionals, CBS has always emphasized the importance of close interaction with Industry in every possible way. All our faculty members are industry practitioners and consequently we were always able to bring in up-to-date industry practices into our curriculum. CBS has decided to focus on making organizations more productive and agile through usage of automation tools. As per the plan, the functional varsities of CBS – HR, Marketing and Finance ? will collaborate with its IT varsity and bring out business solutions for various functional applications. On a need basis, CBS will partner with technology or consulting firms to develop and productize the various tools. 1. A comprehensive cloud-based HRMS (Human Resources Management System) built on a JAVA platform and an Oracle & MySQL data base that covers all aspects of human resource management. The tool provides extensive employee interaction through Android and iOS digital platforms. The unique feature of this HRMS is that it comes with strong content from CBS for Training & Development and competency building. The T & D tool will also be available on a standalone basis and integrated with the CBS website on a use and pay basis. 2. A nuanced cloud based product, ?Business Travel? is a tool providing end to end facility for managing business travel. It builds in operational flexibility, control and powerful data analytics. 3. Payroll system is base level payroll and HR compliance management tool to cater to the large SME space. All the products come with Mobile interface, cloud hosting and pay per use model and recognize the changed landscape of technology.